HERO is the ultimate Shoutcast Icecast Radio Player with history support. Its authors have provided over 30 js options from where you can customize your player, including: width, autoplay, colors and other parameters. Just add the radio stream and the player will get the current playing song and artist photo. The Shoutcast Icecast Radio Player can be used in websites which are responsive. Optional parameter to disable responsive behavior in order to integrate it in non-responsive websites. You can choose from the 2 available skins: back & white. Also, from parameters you can create any color scheme, having the possibility to integrate it in any design. Parameter to set the radio player in sticky version. Additional parameter to only show the play button. It will automatically get the history for ShoutCast streams. For IceCast streams it will generate the history as the radio plays. Button to show or hide the history. Also option to start the player with the history hidden. You can share the radio player on Facebook and Twitter. Parameters to customize the share title and description. 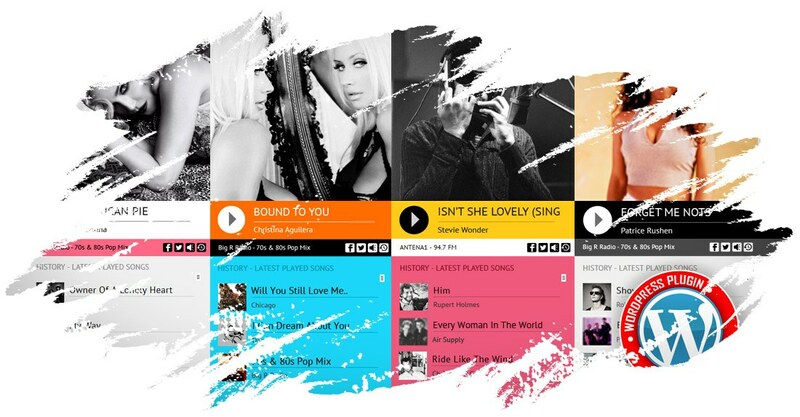 You can insert multiple radio players on your website or on the same page. Only one can be set as ‘sticky’. You can set as visible or set as hidden: playlist, volume, share buttons. Over 30 options from where you can customize your player, including: width, autoplay, colors and other parameters.